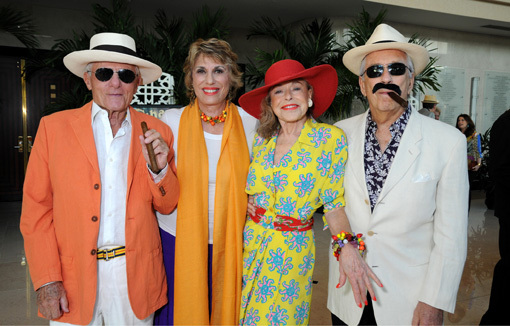 Lee Spiegelman, Linda Binder, Marilyn Meyerhoff and Sam Feldman. WEST PALM BEACH, FL – Would you brake for a 200-person-long conga line on a red carpet? 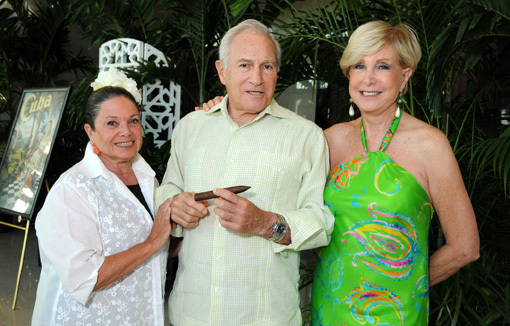 The celebration, co-chaired by Jan Willinger and Don and Linda Silpe, benefitted West Palm Beach’s only professional theater company. The pavilion faithfully incorporated the Latin theme throughout the evening. 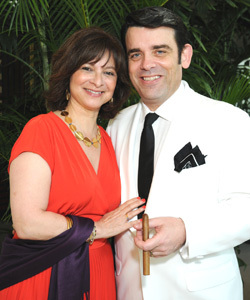 Initially, guests were treated to cocktails in a tropical-garden setting reminiscent of the Tropicana’s Havana neighborhood. Then they moved into the grand ballroom, which was transformed into the legendary nightclub with floor-to-ceiling high Royal Palms, exotic flowers and even native birds. The evening continued with Producing Artistic Director William Hayes inviting Palm Beach Dramaworks Board Chairman Mark Perlberg to the stage. Both honored long-time supporter Ed Ricci with the fifth annual “Shelly Award” for his support. Grammy award-winner “Tomasito” Cruz and his Salsa/Tropical Rhythms Orchestra and Stage Show had guests toe-tapping and shaking maracas in the nightclub setting, glowing in shades of tropical gold and green light, with tables topped with prize-winning birds of paradise. Sponsors for the March 17, 2012, program were acknowledged by Managing Director Sue Ellen Beryl. Don and Linda Silpe and Jan Willinger also welcomed the guests and thanked their Gala Committee, including Calla and Ralph Guild, Roy Bartolomei and Peter Wronsky, Penny and Mitchell Beers, Susan Bloom, Hon. Ann and Don Brown, Peter Cromarty, Esther and Sidney Dinerstein, Hermine Drezner and Jan Winkler, PNC Bank, Daphne and Robert Fessler, Mimi and Alec Flamm, Beth and Mark Goldberg, Kelly and Michael Gottlieb, Roe Green, Lois and Allan Hutensky, Northern Trust Company, Dorothy Lappin, Sidney Lesowitz and Peter Rogers, Hon. Mary Lupo and Ed Ricci, Zelda and Allen Mason, Pamela and Brian McIver, Marilyn Meyerhoff, Diane and Mark Perlberg, Stephanie and John Pew, Marsha and Stephen Rabb, Ann Marie and Peter Rezzonico, Linda and Jay Rosenkranz, Shari Santell, Marlene and Martin Silver, Selma and Joseph Sitrick, David Veselsky and Kenneth Elias and Shelia and Larry Wilensky. Special Impressions catered the Cuban-inspired dinner, and the program was planned by designer Peter Rogers.